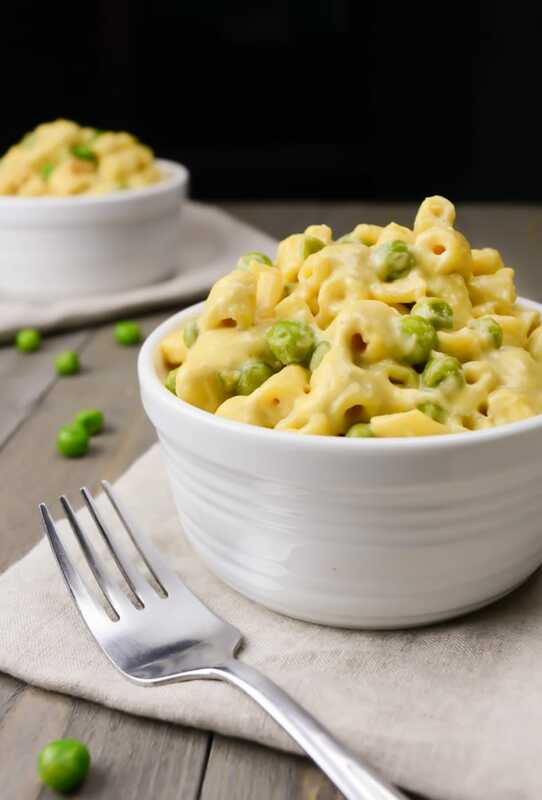 A Vegan Mac and Cheese so creamy and cheesy it’s the perfect dairy free alternative! This classic comfort food can be made stovetop or in the Instant-Pot. A few years back I dappled in vegan cheese sauce recipes creating this Jalapeño Nacho Cheese. Around that time, the potato/carrot based cheese sauce was all the rage. So as you can guess, that was the base of my nacho cheese. It’s my favorite ‘cheese dip’, but I wasn’t fond of it over pasta. 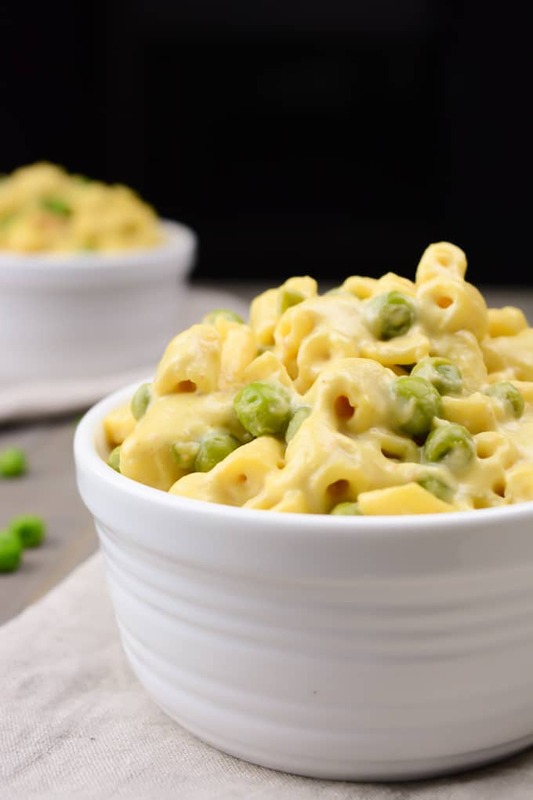 That’s when this Creamy Vegan Mac and Cheese saved my classic comfort food cravings! 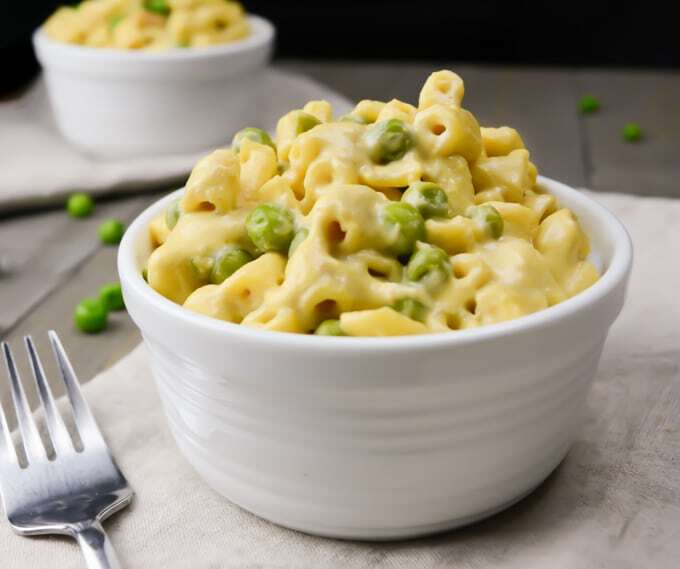 This cheese sauce is cashew based creating a perfectly creamy vegan cheese sauce the whole family will love. 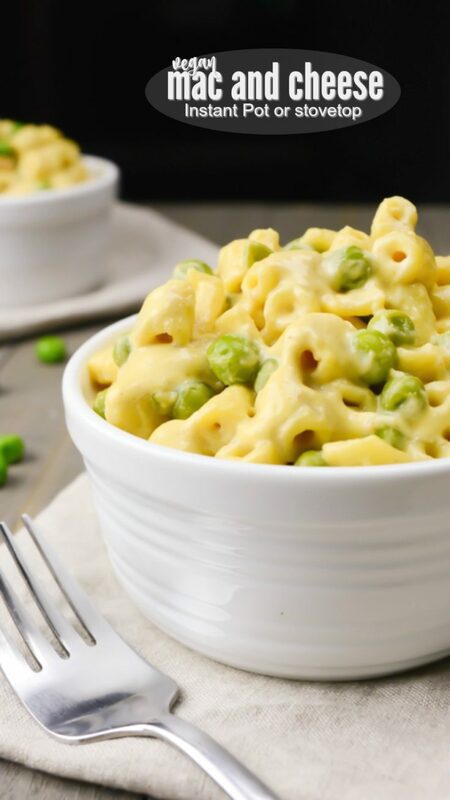 The peas aren’t the only flavor addition to this classic pasta dish. Sautéed onions also make an appearance. Sautéing the onions first brings out their natural sweetness further enhancing the taste of this vegan mac and cheese. 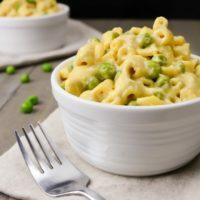 How do I make Vegan Mac and Cheese? 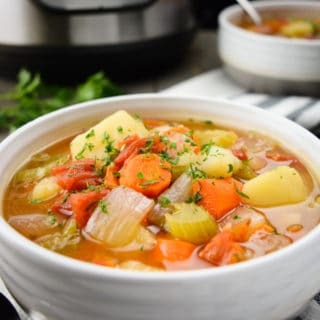 This recipe can easily be made in the Instant Pot or on the stovetop. Instructions for both are included! My favorite way to prepare this mac and cheese is in the Instant Pot. If you don’t own one, I highly suggest getting one. It has quickly become one of my favorite kitchen appliances. Pressure cook the mac and cheese. It’s so easy my husband has successfully made it on nights I’m not up for cooking! 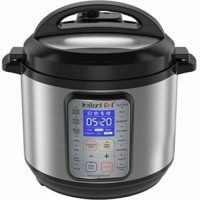 If you don’t own an Instant Pot I’ve included stovetop instructions as well. The method is just as simple and can be made in one pot. The only difference is the pasta will simmer on the stove and need a bit more attention. There have been a few times I’ve made pasta in the Instant-Pot with a slight hiccup. The pressure time begins counting down before the pot has reached full pressure. Since pasta sinks, it can stick to the bottom of the pot. When this happens, my solution has been to turn the IP off, set the valve to release any pressure that may have built up, then carefully open the lid. Now give the pasta a good stir being sure to free any noodles stuck to the bottom. Reseal the lid and set the IP to low pressure for 5-10 minutes. It should come to pressure now and cook perfectly. 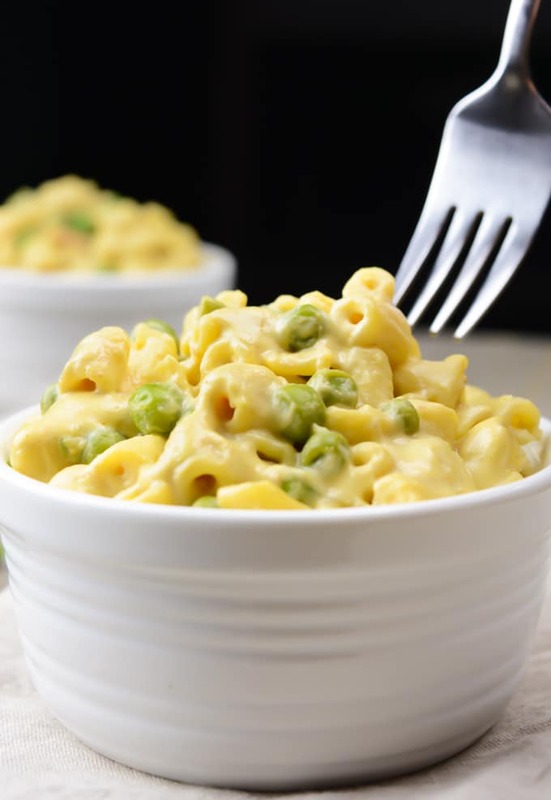 Vegan Mac and Cheese is so creamy and cheesy! It’s the perfect dairy-free alternative to a classic comfort food. This one-pot recipe can be made stovetop or in the Instant-Pot. Once the cheese sauce has been prepped, Using the Instant-Pot's sauté feature, sauté the onions in oil, or water, until softened and slightly browned. This should take about 5-8 minutes. Once the onions have cooked, press the cancel button on your IP. Now add 2 cups of water, 2 cups broth and the blended cheese sauce to your IP. After adding the cheese sauce swirl the reserved 1/2 cup of water around in the blender and include that water to the IP. Give it a mix then wait for the water and onions to settle. Once the water has settled, add in the pasta but don’t mix again. (Allowing the onions to settle on the bottom of the pot will help keep the pasta from sticking.) Seal the lid and steam valve. Using the manual/pressure level feature, cook on low pressure for 13 minutes. Allow it to naturally release pressure for 10 minutes before opening the lid. Carefully open the lid and give the mac and cheese a stir. Add in the peas and give it another stir. Start by prepping the above cheese sauce. Add the diced onion and oil to a large ceramic or non-stick pot. Sauté over medium heat for 5-8 minutes, or until softened and slightly browned. Pour the 2 cups of water, 2 cups of broth and blended cheese sauce into the pot. Swish the remaining 1/2 cup of water from the cheese sauce around in the blender to clean it, include that water to the pot as well. Add in the pasta and give it a mix. To soak cashews: In a small saucepan, boil a cup of water. Turn off the heat and add the cashews. Allow them to soak for at least 10 minutes or until softened for easier blending. 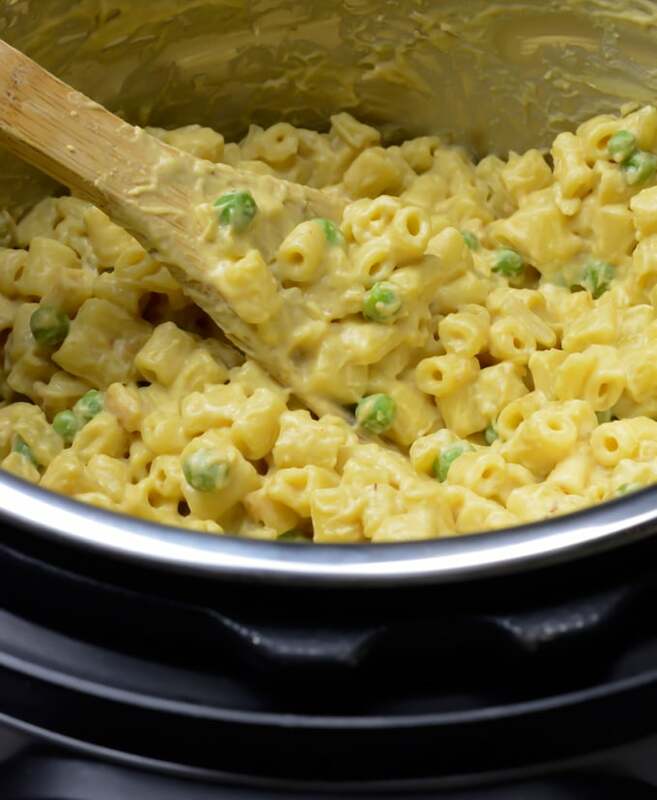 Instant-Pot: The above Instant-Pot cooking method produces an al dente mac and cheese. If you like your pasta softer, add up to 1/2 cup more water and allow the mac and cheese to sit for 20-25 minutes. Seasonings: I never level seasonings or spices while cooking. I measure them slightly rounded. Leftovers: For best results, reheat any leftovers in the oven. 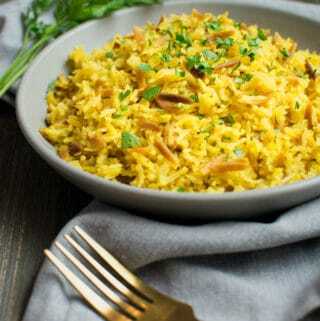 Place in an oven safe dish, cover with foil and bake at 350ºF for 20-25 minutes or until thoroughly heated. This was extremely good! Thanks!! Yay! I'm so glad you enjoyed it, Dawna! I didn’t have an onion on-hand but made the recipe anyway (and doubled the onion powder). My whole family (3 kids included) enjoyed this dish! I’ll be making it again and experimenting with other veggies as well; I was actually thinking of throwing in sauteed mushrooms and spinach or kale at the pea step, as the other reviwer mentioned. 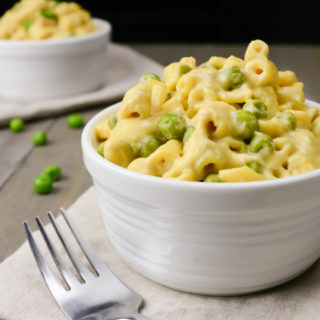 I’ve made countless vegan mac ‘n cheese recipes and this was one of the easiest. Thanks for the recipe—I’ll check out your others! I'm so glad to hear it was a hit with your family! Yum, spinach and mushrooms would also be a great addition! I'll have to try that as well! I just tried this. I was skeptical at first. I’ve tried the other vegan cheesy sauces with carrots and potatoes. They were ok but just not what I was looking for. I used elbow macaroni. I didn’t have mustard seed so I used a dash of ground mustard. I added a few dashes of ancho chili powder. I didn’t have peas but I sautéed kale and mushrooms, on the stove. When the IP was done, I stored the pasta and my first reaction was disappointment. Then, I tasted it! This is the BEST cheesy pasta I’ve tried!!!! Thank you so much for the recipe!! You're very welcome Tami! I'm so glad to hear it wasn't a disappointment. And instead it was the BEST cheesy pasta you've tried! 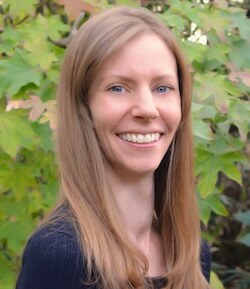 I love your addition of kale and mushrooms. I'll have to try that next time.